Summer break is over and students and faculty are settling into a new school year. On the Chofu campus we were welcomed back by a new sight. What was once a hole in the ground, earlier this year, is now a state-of-the-art center for art, music and design. The Creative Arts Design Center (CADC) officially opened on August 24, with a dedication ceremony. Architect Paul Tange (view website)—whose daughter Aya graduated in 2012—Shigeto Ozawa, president of Koshin Contracting Corporation and Head of School Ed Ladd conducted the ribbon cutting ceremony. Following the ribbon cutting, guests moved into the Bender Plaza, named for former Elementary School Principal Dan Bender, on the second floor of the building. Tange spoke about his design process, which considered the multiple needs of the school and the impact the new structure would have on the surrounding neighborhood. He noted that some of his original ideas for the project came to be modified over time as the situation and requirements evolved—mirroring the design process that students will explore in the CADC’s design labs. 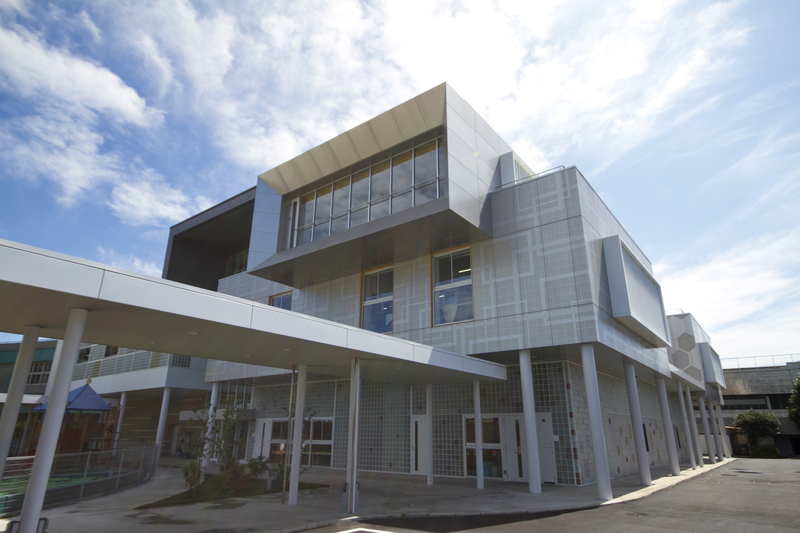 Tange’s previous work includes our High School Library, the school’s facade and athletics building. Presentations from the site manager and speeches from Ozawa and the Head of School followed, before a traditional hand clapping ritual, which marked the end of proceedings. The Creative Arts Design Center has bright, open spaces that include collaborative areas and tools that will nurture inquisitive students. High ceilings and large windows exemplify the values ASIJ places on learning—enabling bright minds to grow and explore. The new building includes two art rooms, two music rooms, a new multi-purpose room, five design technology labs, a robotics lab, a strings room, the Japan Center, an IT center and professional learning suite. Each space is designed for flexibility, allowing for movement and adaptation for a range of uses, in addition to their primary functions. If you would like to learn more about the new Creative Arts Design Center, continue to check back as we introduce classrooms and features in the following weeks.